Sales of Turkey Twizzlers - criticised by school dinner standards campaigner Jamie Oliver for containing too much fat - have risen. Maker Bernard Matthews said it had shifted 32% more last month than during the same period in 2004. 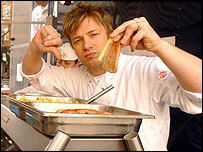 On his TV show, Jamie's Dinners, Mr Oliver said Twizzlers were bad for children's health. But Bernard Matthews said the processed product contained only a third of the level of fat found in a pork sausage. Managing director David Joll added: "The company has no plans to withdraw a product that was reformulated last year to contain 7% fat per 100g (cooked), which falls well within the 10% allowed in schools. "We have been unfairly treated over a turkey product, which is the least fatty of all meats. "We were picked out by Jamie Oliver because everyone has heard of Bernard Matthews, yet we are a company that has been responding to health concerns for years and going down the low-fat route." Following Mr Oliver's Channel 4 programme earlier this year, school meals contractor Scolarest said it would stop supplying Twizzlers. Mr Joll said: "A Twizzler has much less fat than a sausage - at 7% it is a third of the fat level found in the average pork sausage - yet we don't hear Jamie Oliver telling people not to eat sausages." Since Mr Oliver's programme - set in a school in Greenwich, south-east London - interest in the contents of school dinners has increased. Mr Oliver found only 37p was being spent per day on food per pupil in the area. The government has promised to raise school dinner standards in England, amid growing rates of childhood obesity. At the weekend, Tony Blair said: "It may take a little time to change children's tastes, but it will be worth the effort if we can get them enjoying healthy and good quality food at school."